Where luxury midsize SUVs are concerned, it’s tough to beat the Porsche Cayenne. It’s a spacious, functional vehicle with a badge that conveys upscale quality and stand-out design, allowing drivers to enjoy the best of two worlds. Come along with us as we explore the features and capabilities of the 2019 Porsche Cayenne right here in Chicago. The Porsche Cayenne is available in 4 different trim levels—base, S, Turbo, and E-Hybrid—so shoppers can find a model that suits them and their lifestyle. Although each of these Cayenne models has its own unique list of elements, every model prioritizes rider comfort, impressive performance, and on-the-go connectivity no matter where the road leads. 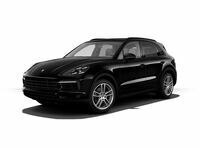 Test Drive the Porsche Cayenne at Loeber Porsche! Completely redesigned for 2019, the latest Porsche Cayenne has a lot of exciting updates to be excited about. On top of increased power, an enhanced E-Hybrid model, and a number of design upgrades, there are plenty of other features and capabilities that drivers should be aware of for the 2019 Cayenne. Standard elements on the 2019 Porsche Cayenne include the new Porsche Connect app, Apple® CarPlay compatibility, comfortable seating for 5 passengers, and a cargo capacity of up to 60.4 cubic feet. The base model can go from 0 to 60 mph in just 5.9 seconds. The Cayenne S has a 0-60 time of 4.9 seconds, and the Cayenne Turbo can get there in just 3.9 seconds. Other notable features of the 2019 Porsche Cayenne include the new Porsche Voice Pilot, Direct Touch Control, 12-inch touchscreen display, colored ambient lighting, Head-Up Display, Lane Keeping Assist including traffic sign recognition, adaptive cruise control, and so much more. When you are ready to get up close and personal with the 2019 Porsche Cayenne in Chicago, we invite you to schedule a test drive with our team at Loeber Porsche.